A new study this week from the Pacific Institute, an Oakland-based environmental think tank, has found that even as California undergoes an extreme drought, agricultural output—which accounts for 80% of California's water use—is at a record level. California’s agriculture sector has exceeded expectations during the most severe drought in recorded history at the cost of massive but unsustainable groundwater pumping. Continued groundwater overdraft…has shifted the burden to others, including current and future generations forced to dig deeper wells, find alternative drinking water sources, and repair infrastructure damaged by subsidence. 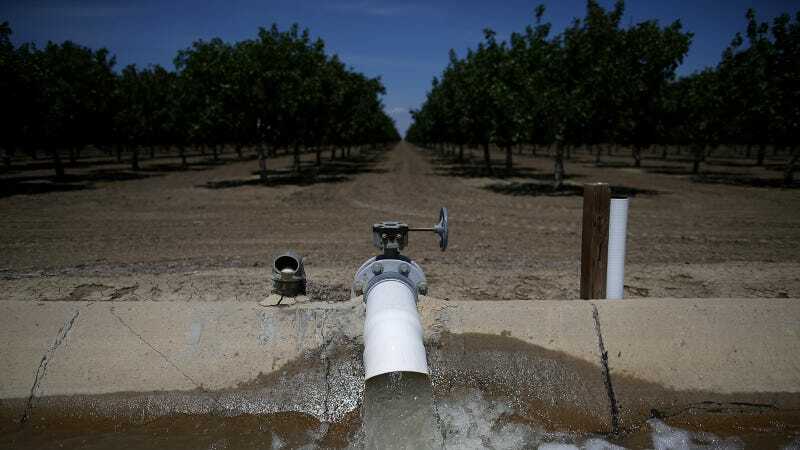 Evidence of excessive groundwater use in California has recently been documented by sinking farmland in the Central Valley, where the massive pumping of well water has led to land subsistence, or sinking, of up to two inches a month in some areas. The Pacific Institute study, which is the first comprehensive analysis of the impacts of the drought on California agriculture through 2014, also determined that crop revenue stability is not only a result of groundwater overdraft, but also a shift to higher-value crops such as almonds, pistachios, and wine grapes. The total increase in fruit and nut acreage since 2000 was 570,000 acres, or 24%, according to the study. Nut orchards, unlike vegetable crops, can't be left fallow during dry years, which presents a long-term challenge for agricultural water use in the region. "The drought has certainly bitten us, but California agriculture by and large is still thriving in most places," Lund continued. "We think that both the jobs and the revenues would be quite a bit more if it weren't for the drought." There are a number of other factors feeding into this perseverance. Crop productivity, or tonnage per acre, has also increased for some important crops, such as strawberries, tomatoes, and walnuts, according to the study. Crop prices have also generally increased over the last decade. Increases in efficiency, which include a shift towards drip irrigation, have actually made it so that a full million acres less of cropland was harvested in 2014 compared to 2000, according to the study. In 2014, farmers harvested 640,000 fewer acres, or nearly 10%, less than when compared to pre-drought levels, even as revenue remained strong. The Pacific Institute also estimated that farmers choosing to voluntarily sell their water to non-agricultural users such as municipalities, industries, and environmental flows, boosted revenue by at least $66 million in 2014. When it comes to jobs, the study found that statewide agriculture-related jobs also reached a record-high of 417,000 people in 2014. However a recent study from the University of California, Davis, found that more than 21,000 farm workers are out of work in 2015 due to California's drought. It also found that those with a job are working harder and making less money. A big part of this problem is smaller fruit, due to the drought, which takes longer to gather and yields less value. The analysis determined that losses to all economic sectors because of the 2105 drought will be as high as $2.74 billion. Regardless the authors of the Pacific Institute study state that "ultimately, California agriculture is changing in many ways to withstand the ongoing drought." "The study’s results provide critical insight into how the state can maintain a healthy agriculture sector in a future likely to see less water, more extreme weather, and greater uncertainty," they state. There may be some short term relief in sight, as forecasters are predicting a record-setting El Niño, or warming of the Pacific Ocean, to bring heavy rain to the drought-ridden state over the winter. Mike Halpert, deputy director of the National Oceanic Atmospheric Administration's Climate Prediction Center, told the AP that California would need 1.5 times its average rainfall to emerge from the extended drought, an amount he thinks is unlikely. Some things that are likely if there is a strong El Niño: flooding, landslides, and a return to the current hot and dry conditions that scientists have confirmed have been heavily influenced by climate change. Just last week a comprehensive study was released showing that climate change was likely responsible for worsening the current drought by 15 to 20%.